Last summer there wasn’t a day that went by when you didn’t hear a report about the devastating Deepwater Horizon oil rig spill in the Gulf of Mexico and the impact on its human and animal residents. Right now the penguin staff at the New England Aquarium are watching the news and learning more about another devastating oil spill. 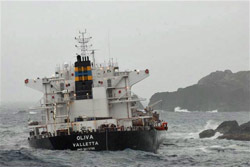 On March 16 the Greek cargo vessel MS Olivia carrying soya beans ran aground off Nightingale Island, part of the Tristan da Cunha island group in the South Atlantic Ocean. By March 18 the ship had broken in two and sank, spilling its fuel oil into the ocean. Any oil spill is a horrible situation but what makes this one particularly devastating is that the Tristan de Cunha island group is home to large concentrations of several populations of sea birds, including Great Shearwaters, broad-billed prions, Atlantic yellow-nosed albatross, white-bellied storm petrels and sooty albatross. These islands are also home to several population of endangered sea birds that are endemic (found no where else) to the area. These birds include the speckled petrel and the Tristan bunting. 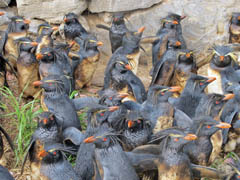 Nightingale Island is home to half the world population of endangered northern rockhopper penguins. 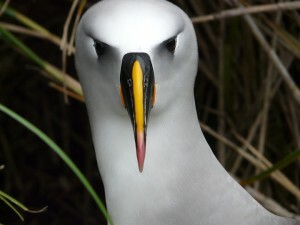 A yellow nosed albatross, one of the many sea birds that are affected by the oil spill. Another potentially devastating result of the ship wreck is the possibility of rats from the cargo vessel gaining access to the formerly rodent free islands and potentially wiping out bird populations far into the future once all the oil has been cleaned up and merely a memory. Researches watch the shoreline anxiously as the northern rockhoppers are finishing up their molting season and thousands of birds are ready to return to the sea with new feathers but empty stomachs after fasting on land for 2-3 weeks. By March 22 it was estimated that 20,000 oiled penguins had returned to Nightingale Island. This rescue attempt will be very difficult compared to past penguin rescue events, like the Treasure Oil Spill in 2000, due to the remoteness of the islands. Tristan da Cunha is the most remote, inhabited island in the world! The closest continent is Africa more than 1,500 kilometers (2,400 miles) away. There are no airports on the islands so it will take rescuers 4-6 days to sail from Cape Town, South Africa. A salvage tug Smit Amandla arrived at Nightingale Island on March 22, on board was Estelle van der Merwe who was instrumental in the successful Treasure Oil Spill clean up. 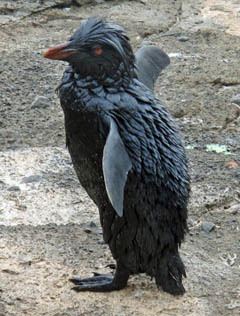 She is working with Tristan Conservation officials to try to start cleaning oiled penguins. Other rescue organizations like SANCCOB (South African Foundation for the Conservation of Coastal Birds) left from Cape Town this week and will be arriving soon ready to help. We are monitoring the situation closely and if you would like to learn more check out the Tristan da Cunha website and the agreement on the conservation of albatross and petrels. Remember to try to live blue™ to keep are oceans clean and healthy. This oil spill is definitely not getting the coverage as past spills, but the devastation remains huge. Hopefully the crews will be able to get to Nightingale Island and help as much as possible. Resources will no doubt be limited. Here's a video you might be interested in embedding and commenting on: http://www.newsy.com/videos/atlantic-oil-spill-kills-endangered-penguins. The video looks as more coverage of the oil spill and how it’s affecting the endangered penguins.